This past weekend a crowd of creative folks got together and made 9 games in 48 hours at Buffalo Game space. BGS Jam 11, the eleventh local only Buffalo based game jam was attended by veteran and aspiring game developers with the challenge of making a game fit the secret theme chosen by the community by Sunday night. Always an amazing learning experience whether you've never made a game before or if it's your 100th project, BGSJam 11 created some new and interesting ideas while minting some new game developers in the process. The theme selected by community vote was "KAIJU". A surprise as always. If you didn't know what a Kaiju is, think Godzilla, Mothra, Ultraman etc. BGS Mascot: Incorporate the BGS Buffalo logo into your game. BGSjam Elven: Game prominently features an elf or elves. From the booth....what is that NOISE?!? : Record some or all of your audio in the sound booth. Gosh Darn You To Heck! : Fill the game's dialogue with extremely mild swears. The Wayne Kubiak Memorial Diversifier: Game includes characters that are mostly or entirely butts. Seven-Eleven: Game also implements the theme from BGSjam7, "With Our Powers Combined"
QUACK! : One of the game's buttons makes the character do something that doesn't affect gameplay at all. Actually, in Buffalo, it was called Doki Doki Panic: Game is a sequel to a game the jammer previously made, but gameplay and scenario are significantly different. Crayola 8-pack: Game's color palette is limited to the 8 standard colors in a box of Crayola markers/crayons (red, orange, yellow, green, blue, purple, brown, and black... I guess white too). We also announced for the benefit of the jammers the runner-up theme in the voting which could be used as a sub-theme. It was High Score. A Tetris-like where each of the shapes are made out of Kaiju. 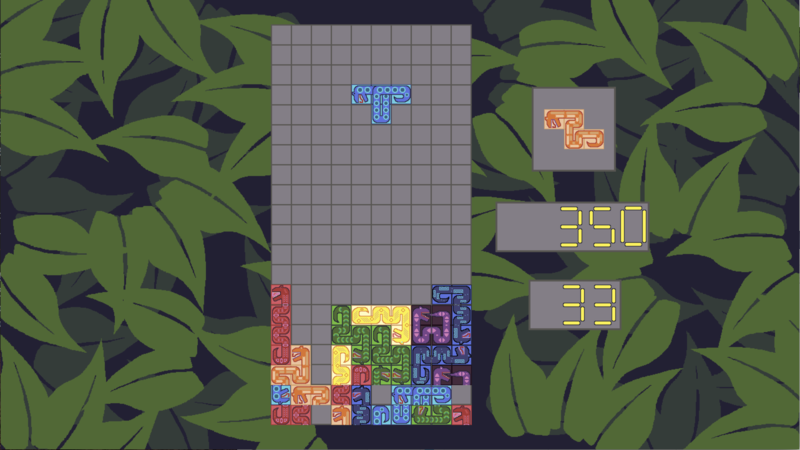 Each part of the blocks are pieces of the snake like creatures that cry out as lines are made and sections are removed. With art heavily inspired by mesoamerican mayan infuences and sounds recorded by the developers themselves it makes for a fun twist on an old formula. From the booth...What is that noise!? 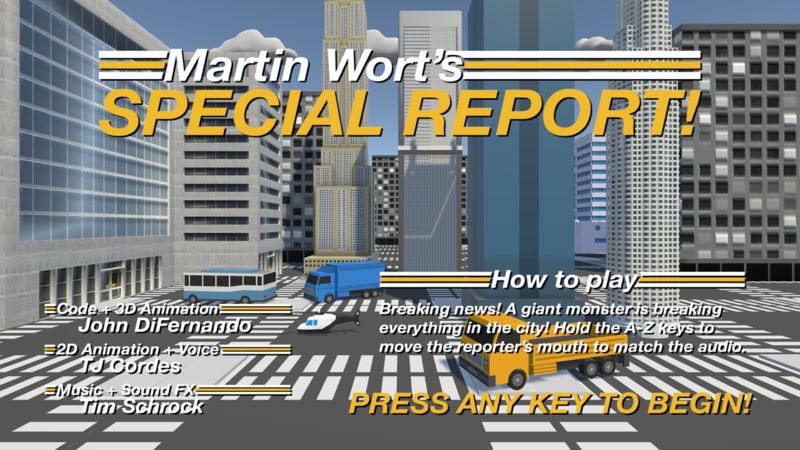 Martin Wort is a man on the street reporter witnessing a Kaiju attack in the city. He calls out the various crazy things he sees and the player can change his mouth animation with keyboard inputs to try to match the scenes being shown and described. Very funny! A lateral sequel of the award losing Epic Quest for Prophetic Destiny, Epic Quest for Herioc Glory challenges players to form a party on the local network to take out a Kaiju. With selectable classes, stats, levels, and other modes it's got everything a co-op dungeon crawler would want! 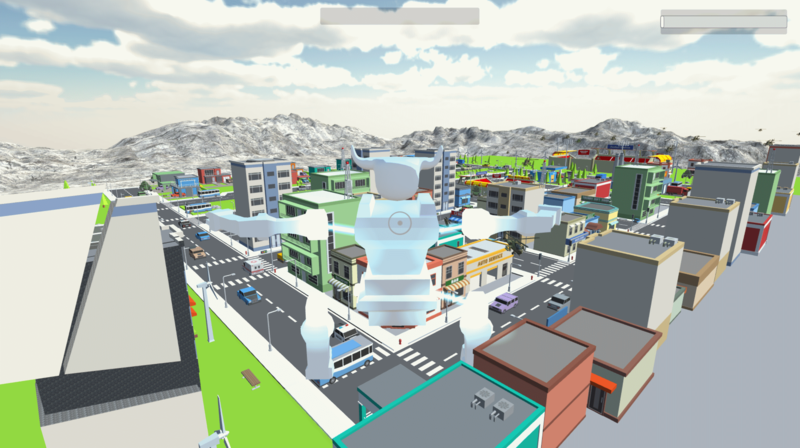 What if you and your friends spontaneously spawned in a giant robot kaiju each with control of different parts of the bot? How does it work? Could you control it? Could you defend yourself? Accidental Kaiju answers these questions in the jankiest of game jam fashion. Grab a flight stick with a throttle and an xbox controller and a few friends to see what happens. Just a guy living out his dream of being a kaiju. As a man in his very own monster suit run around and cause all the chaos you ever desired and soak in the admiration of the populace. Destroy stuff for points. Look cool in front of lots of people for more points. Don't let the cops beat you up. As a monster attacks the city it grows with every person it eats. Use your assortment of weapons in a first persion view to defend the people and shrink the monster until it can be killed. 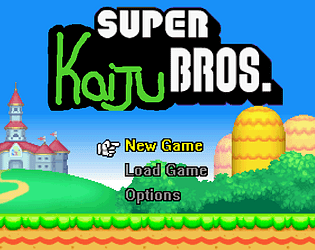 Created by first time game developer Trinity, become a kaiju in classic Super Mario fashion(or is it Bowswer!?). 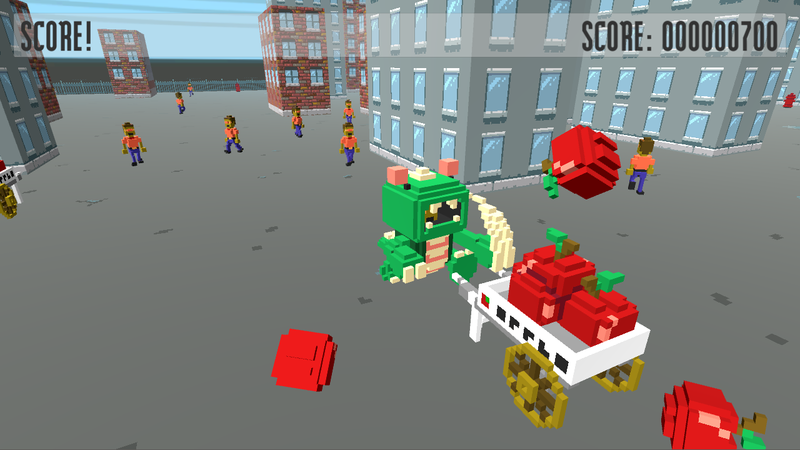 Collect coins, take damage, jump and power up! 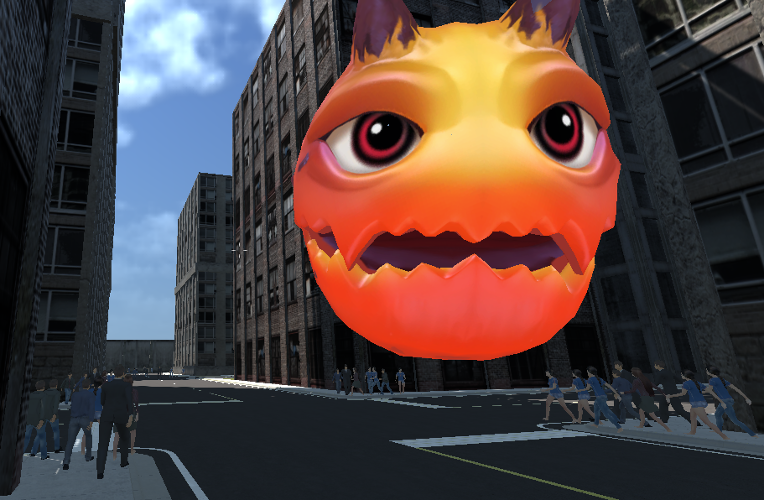 A digital pinball game inspired by kaiju monster movies. Through the metal riffs, use your ball to blast monsters and unlock secrets. Can you unlock the tank and defeat boss? Go for the high score. A party game where clips from kaiju movies are shown and players are asked to provide their own translations which are digitally dubbed in and played back. 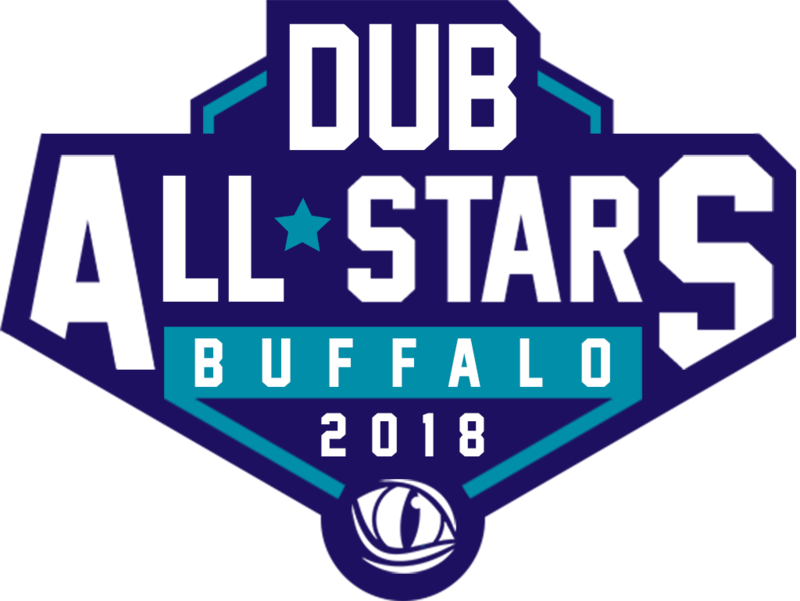 Hosted on the web, both players and audience members use their phones to connect, play and vote on the best dubs. Very funny and fun for groups of any size! And all these games were created right here at Buffalo Game Space in under 48 hours. Amazing to think that none even existed as ideas before Friday night and now you can all play them! Be on the lookout for some of them to get some continued love and possibly show up in a shinier, fancier package in the future! As always, the jams exists as an amazing opportunity to learn by doing around other great and talented folks. To see what else these great folks have been working on and more, and meet them in person, come see us on June 9th at BGX, the Buffalo Game Expo.